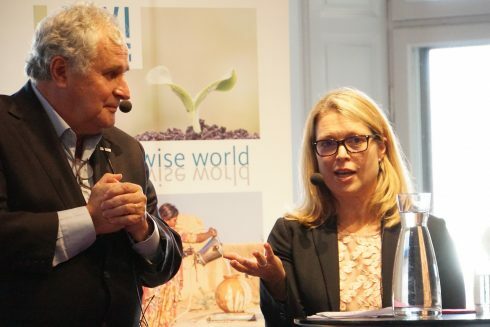 “I think you value water the most when you don’t have water.” With these words, Torgny Holmgren, Executive Director of SIWI, opened the Swedish Water House seminar “Do you value water?” in which he then elaborated on how water scarcity makes us re-think our priorities. The following expert discussion led by John Joyce, Chief Economist at SIWI, dealt with topics from philosophical questions on the complexity of the concept of valuing to concrete matters such as the High-Level Panel on Water’s (HLPW) Principles for Valuing Water. These five HLPW principles have been developed in a bottom-up process with a broad base of stakeholders – including e.g. indigenous peoples, representatives from the Vatican and the World Bank – to account for the many different values that water has, be it economic, ecological, spiritual or cultural. Maria Håkansson, CEO at Swedfund and one of the seminar’s discussants, described how Swedfund’s investments are based on three pillars, Impact on Society, Sustainability and Financial viability. She underlined the importance of water for all three pillars. One particularly issue Håkansson raised is the difficulty of investing directly into water projects since they are often state-led. She then explained how they work around this by investing in other related areas, such as e.g. energy, which are closely connected to water. Håkansson concluded her presentation by acknowledging the importance of the HLPW’s five principles and how they can integrate them into their work. François Brikké, Senior Network Officer at the Global Water Partnership, lifted the importance of faith-based organizations (FBO) for water issues. He highlighted that cultural and spiritual values are oftentimes the least considered and underlined the unique reach of FBOs. FBOs are in many instances already an established part of societies and involving them can positively impact the sustainability of initiatives and projects. Brikké also highlighted the importance of justice and dignity as intrinsic values in most spiritual traditions and the strength that lies in this. “The question is not if we should engage with faith-based organizations,” Brikké concluded, “the question is how”. The engaged discussion with the audience tied back to the very beginning of the seminar and underlined the complexity that comes with valuing water. In their concluding remarks the presenters urged that there is a momentum for water issues and it is time to re-value one of our most important and undervalued resources: water. Principle 1. Identify and take into account the multiple and diverse values of water to different groups and interests in all decisions affecting water. Principle 2. Conduct all processes to reconcile values in ways that are equitable, transparent, and inclusive. Trade-offs will be inevitable, especially when water is scarce, and these call for sharing benefits amongst all those affected. Principle 3. Value, manage, and protect all sources of water, including watersheds, rivers, aquifers, associated ecosystems, and used water flows for current and future generations. Principle 4. Promote education and public awareness about the intrinsic value of water and its essential role in all aspects of life. Principle 5. Ensure adequate investment in institutions, infrastructure, information, and innovation to realize the many different benefits derived from water and reduce risks.